I guess this is supposed to be a Thanksgiving post, but . . . it’s not. I had the best intentions! See, there was major pot luckage scheduled for tonight: a Thanksgiving potluck with my Sunday school class including all of the traditional turkey day fixins. I tried to sign up to bring a dessert, but wouldn’t you know, they started the sign-up sheet on the other end of the class and three people tackled dessert before it got to me. 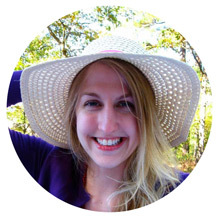 I signed up for sweet potatoes instead and started making great plans: I was going to make my mom’s marshmallow-topped sweet potatoes, and for anyone crazy enough not to love those, Ezra Pound Cake‘s Rosemary Roasted Sweet Potatoes. I was prepared! And then . . . suddenly . . . I was sick. SICK. I could whine about this for paragraphs, but suffice it to say, I have been one sore-nosed, tickly-throated, marathon-sneezing unhappy camper. So . . . I raised the white flag and canceled my RSVP to the potluck. Something did raise my spirits, though. Something decidedly un-Thanksgiving-dinneresque. Barbara Bakes posted a provocative picture of a cheesy, saucy enchilada that revved up such a strong craving that Barbara might have almost acquired a new roommate. Or at least nightly dinner guest. I started making new plans. While I may have been too sniffly for a large festive gathering, I could at least invite Mike over for a Mexican feast: Creamy Chicken and Green Chile Enchiladas with Mexican Sausage Rice. These enchiladas are pure comfort food. They’re gooey with a sumptuous, tangy, creamy, salsa verde-based sauce. Mike and I are thrilled to have over half a pan to devour as leftovers! They’re also so simple to make. I used a store-bought rotisserie chicken instead of roasting my own, cutting down on the cooking time (cut me some slack — or I’ll start whining again). 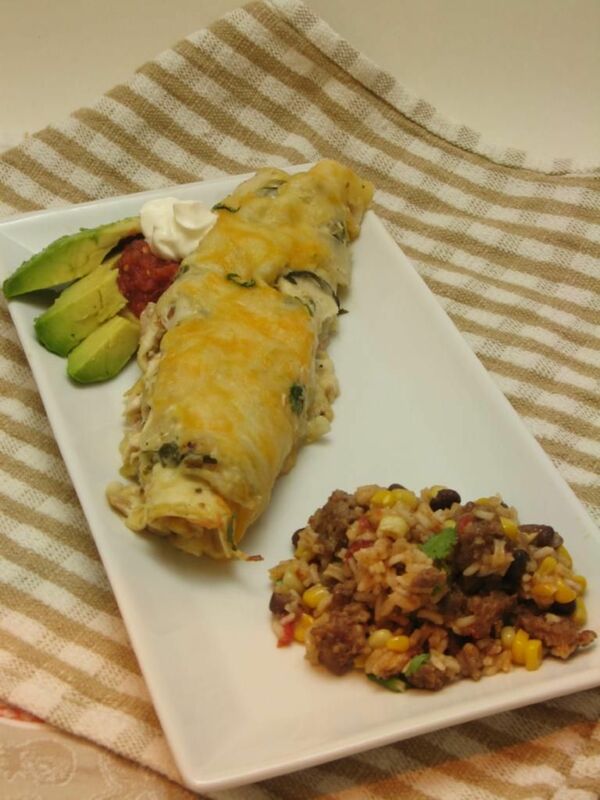 These amazing enchiladas are definitely on the “make again” list. The Mexican Sausage Rice was also good, though perhaps it needed a little spice punch. Right off the stove it seemed a bit mellow in flavor, but it did begin to taste bolder as the flavors were allowed to meld. I’m looking forward to eating some heaping scoops of it with lunch tomorrow after it’s been refrigerated overnight. 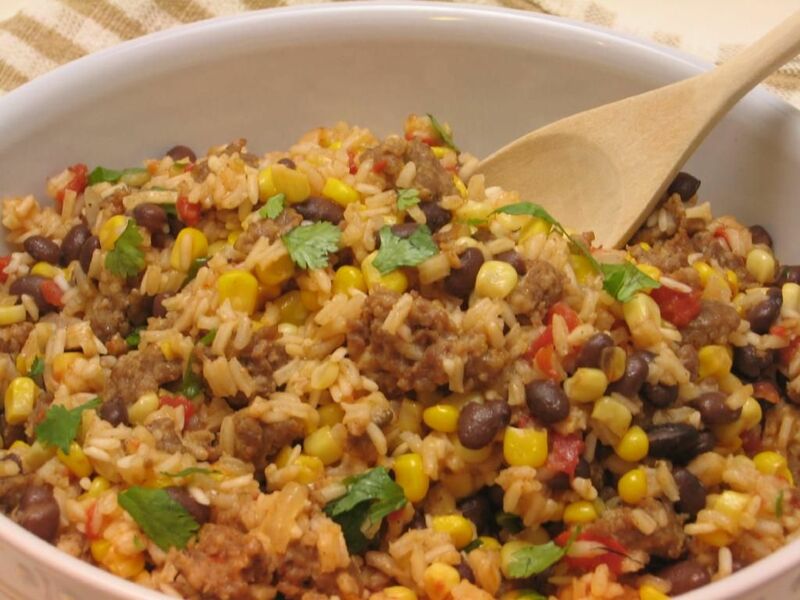 The corn adds the perfect sweetness to contrast the sausage, chili powder, and chiles. You should also know that there’s a whole truckload of optional add-ons at the end of the recipe (see below) that I forgot to add — toasted pumpkin seeds, cheese, lime — all of which might’ve brightened the flavor. I’ll have to give them a try tomorrow. Where’s the dessert, you ask? You’ll have to wait for that one! You see, I didn’t just lie in bed and whine this morning (that was only the first couple of hours). I also completed my November Daring Bakers challenge, which Mike and I enjoyed after our Mexican feast. Dessert definitely derailed the nationality of our meal, but I can’t say another word about it. Check back in soon to see! In the meantime, go assemble some of these simple, rich, comforting, cheesy enchiladas. Directions: Preheat oven to 375 degrees. Place chicken on a large baking sheet and drizzle with olive oil and sprinkle with salt and pepper. Roast in oven for about 40 – 50 minutes or until the internal temperature is about 170 degrees. Remove from oven and let cool. When cool enough to handle, shred chicken into bite-sized pieces and place in a bowl. Set aside. Meanwhile, heat a large saucepan to medium high and add 2 tablespoons of olive oil and the onions. Saute for 8 – 10 minutes or until the onions are lightly browned. Add the garlic and cumin and saute for an additional minute. Stir in the flour until blended and cook for a minute. Slowly pour in the chicken stock and bring to a boil. Cook for 2 – 4 minutes or until thickened. Add the salsa verde, sour cream, and cilantro. Stir to combine. Season the creamy green chile sauce with salt and pepper. 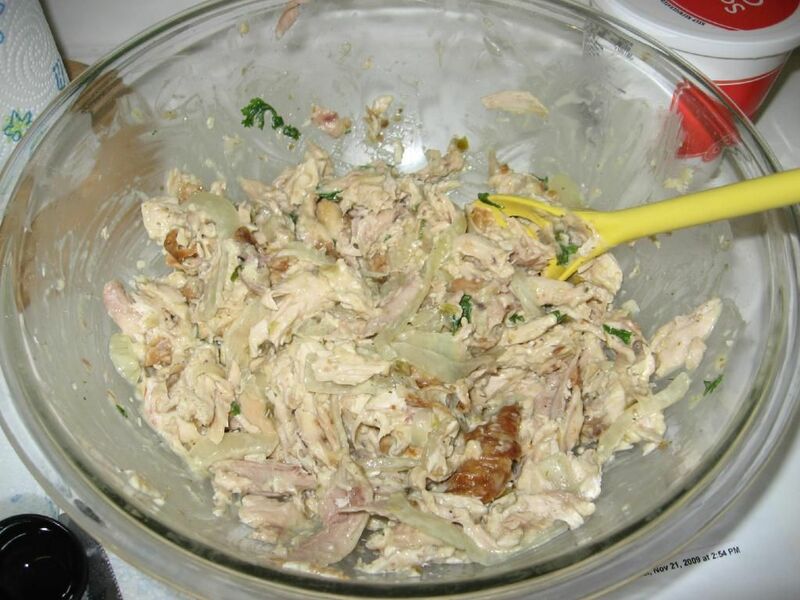 Add about 1 cup of the creamy green chile sauce to the shredded chicken and stir to combine.To assemble enchiladas get a large baking dish and spray with cooking spray. Dip a tortilla into the creamy green chile sauce and put it on a cutting board. (You can also put tortillas in the microwave for a few seconds to make them easier to work with.) Put a big scoop of the chicken mixture in the center, sprinkle with a little of the cheese, and roll up the tortilla to enclose the filling. 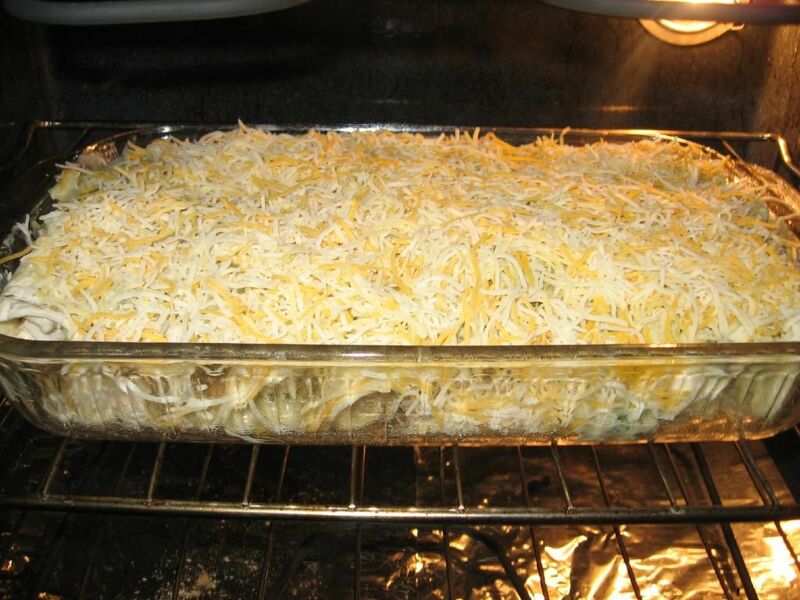 Place the enchilada in the baking dish. Continue to fill all of the tortillas and put them in the baking dish. 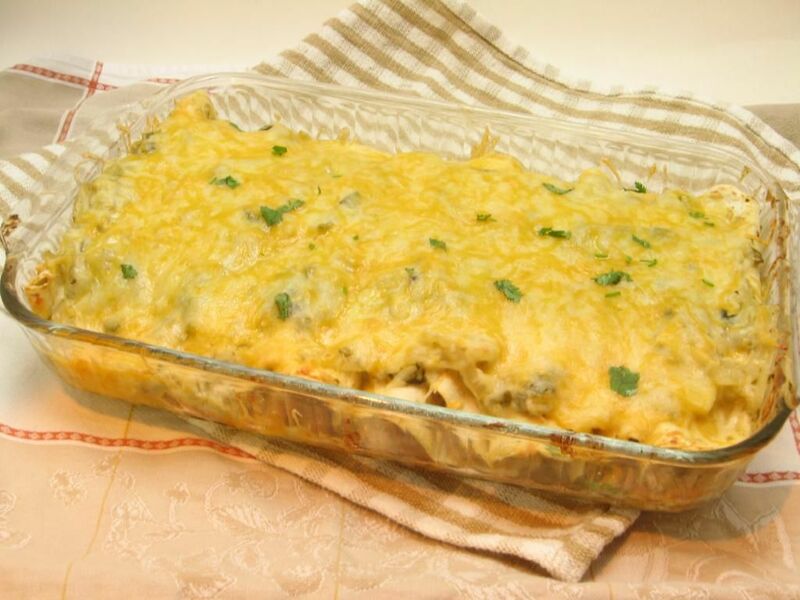 Pour the remaining creamy green chile sauce over the top and sprinkle with the remaining cheese. Bake uncovered for about 20 – 25 minutes until bubbly and the cheese is melted. Serve hot with sour cream. Directions: In a 3 or 4-quart saucepan, cook sausage and onion over medium-high heat, stirring frequently until meat is thoroughly cooked and no longer pink. 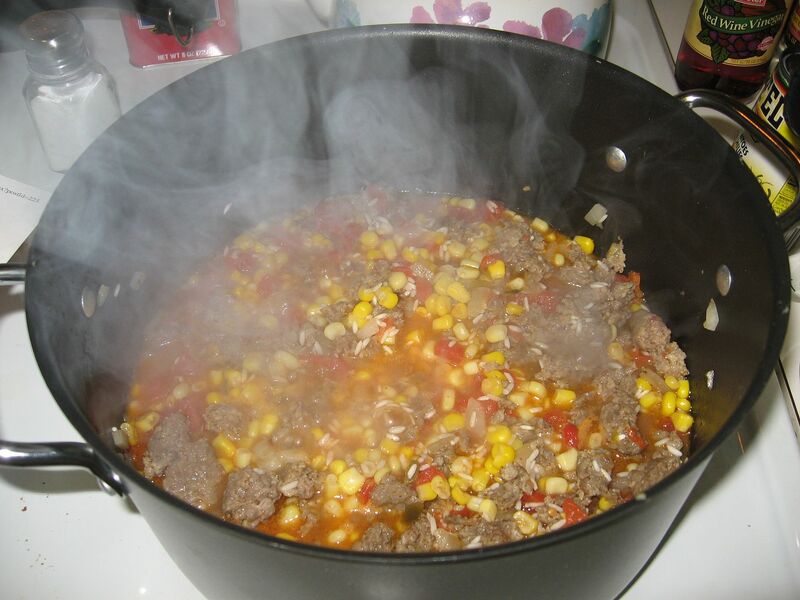 Add rice, corn, cumin, chili powder, tomatoes & green chiles, water or stock and salt; stir once to mix. Bring to a boil, cover, reduce heat to low and simmer 25 minutes without stirring. Gently stir in black beans; add green onions if desired. Garnish with any or all optional ingredients. Rice and enchiladas getting started! Enchiladas in the oven and finished Mexican Sausage Rice. Feel better soon Julie! These look fabulous =D. I don’t mind the non-Thanksgiving post (it was a month ago for me), and the flavours are great! Barbara always has such great recipes! Thanks, Lauren! She really does! 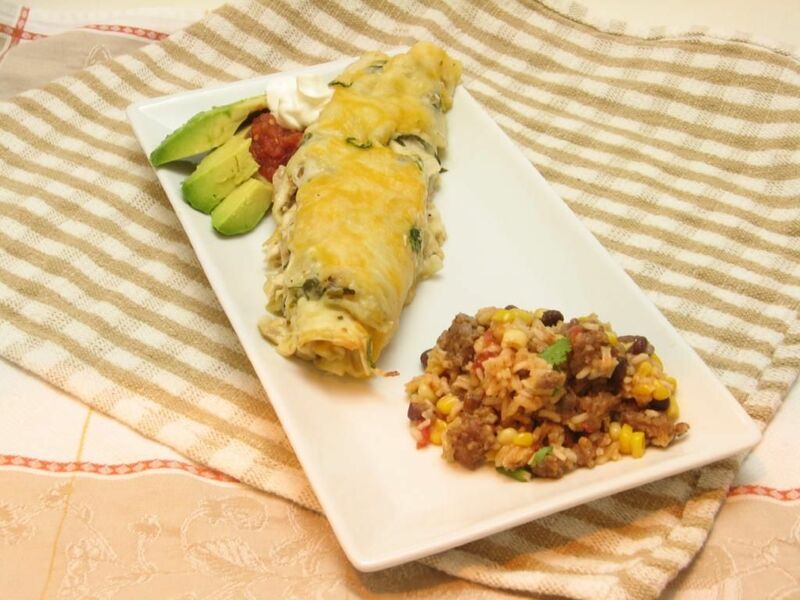 I love how you styled your enchilada with avocado, salsa and sour cream. Yum! 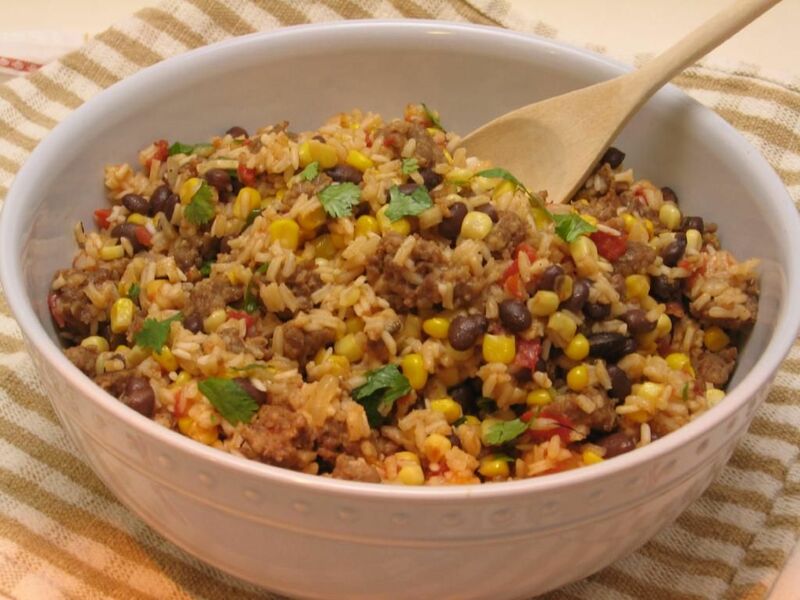 The Mexican rice is a perfect side with this, or I bet you could cover it with cheese, bake it a bit and make a wonderful main dish out of it. Thanks for the kind words! Thanks for passing along a great recipe, Barbara! How delicious! 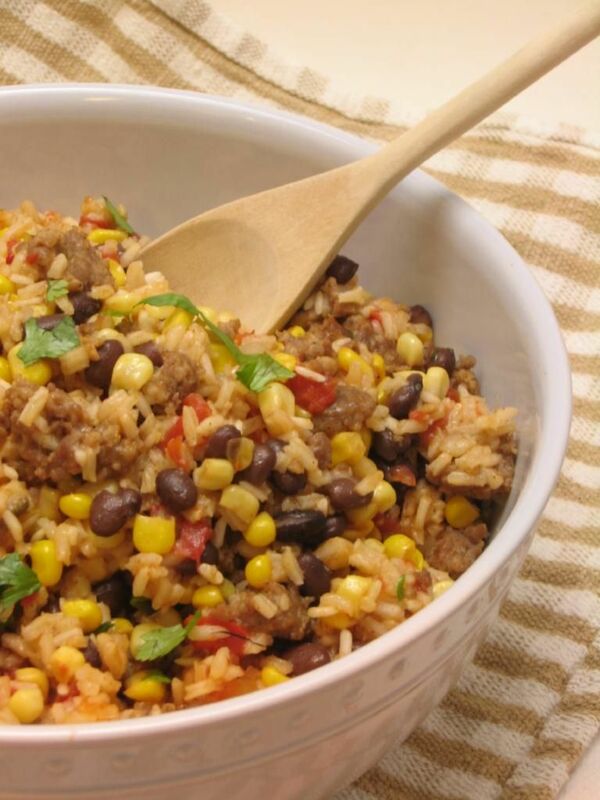 I love the addition of corn to the rice…yum! These are right up your alley, Amelia! I bet you guys would love ’em. This entire meal looks so delicious!! So glad you enjoyed my recipe. I like the addition of the sausage to the rice. 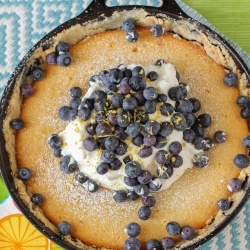 It is always a hit – I will have to make it for my family and my clients again soon.